NOTE: NEW PACKAGING PRODUCT DIFFERENT FROM IMAGE. Pure White Soy Complex 30 Gentle Maximum now with added conditioners. Guarantees Freshness for 3 Years. 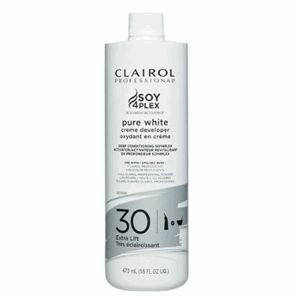 Pure White mixes with any Clairol Professional haircolor into a creamy consistency. 30 Volume Maximum Lift is ideal for achieving the lightest results in a single process application. Not recommended for bowl and brush or applicator bottle. Water (Aqua/Eau),Hydrogen Peroxide, Cetearyl Alcohol, Ceteareth-25, Salicylic Acid, Phosphoric Acid, Disodium Phosphate, Etidronic Acid. For best results, follow hair color manufacturer’s recommended mixing instructions. Mix well. Do not use metal bowls/stirrers. Keep cap tightly closed when not in use. Store in a cool, dark place and keep away from excessive heat and light. Never return unused product to the bottle. Do not store mixed developer and hair color in a closed bottle as it may cause internal pressure and break the container. WARNING: Contains Hydrogen Peroxide. Avoid contact with eyes, rinse eyes immediately if product comes into contact with them. Immediately rinse any splashes on the skin and clothing. Wear suitable gloves. Keep out of the reach of children. Do not use when hair has previously been colored with metal dyes. Rinse hair well after application. The bottle must be completely empty before disposal. CAUTION: For use by licensed cosmetologist only. Use by non-licensed persons may results in unsatisfactory performance. Hair color products may cause allergic reactions, which in area instances can be serious.